The Government of India needs to formulate a comprehensive policy on the production, use and release of genetically modified organisms (GMOs).The GMOs are produced through the use of genetic engineering technology in which a gene belonging to one organism and often coding for a particular protein performing a specific function is introduced into another organism which does not have that gene and, therefore, does not produce that protein. When the Board of Doon School Governors selected Dr Peter McLaughlin, a specialist in military and defence history to head the school in 2009, it was reposing faith in the Irish man’s academic credentials and exposure to International boarding schools. Akhlaq Moha-mmed Khan ‘Shahryar’ is the fourth Urdu poet to win the prestigious Jnanpith Award. The other three were Firaq, Ali Sardar Jafri and Qurratulain Hyder. While Firaq’s Ghazals were sung by Begum Akhtar, Shahryar became the first Jnanpith winner whose poetry is widely known through popular film music, having been used in films like Muzaffar Ali’s Umrao Jaan and Gaman. What are your views on the recent Ayodhya verdict? It is not for me to say whether the verdict is correct or not. It has to be seen whether in a title suit, judgment of that kind is appropriate or not. The perception is that it has gone more on faith than on evidence on the record. The Supreme Court will go into this when the appeals are filed by both parties. There is no question of the Government of India filing any appeal because it was not a party to this suit. So, it will be definitely adjudicated before the Supreme Court and let us wait for the decision. Do you think the judgment would have been different if the mosque had not been demolished in 1992? In fact, it is a question of possession, whosoever was in possession at a relevant time. Ultimately, what is the evidence on this score, it will go by that. Yes, it was a fact that the mosque did exist. Again, the question is whether before the mosque something else was there (or not). Even in the evidence which is led they said that there are some ruins. There is no indication that there was a temple. If the mosque still existed, would it have made a difference to the judgment? Naturally, possession is 99 per cent of proof.The BJP is treating the judgment as a judicial sanction or pardon for the 1992 demolition? I do not think that this could be construed as a judicial sanction. It cannot be treated as regularisation of the aggression or the demolition. The demolition is a separate issue and the cases against Mr Advani and others are still pending. So this verdict cannot be linked to that. Even the judiciary has no power to do this. What is done illegally cannot be legalised by a judgment. What is your view about the happenings in Karnataka? There are questions being raised on the conduct of both the Speaker and the Governor of the state. The first time when the Governor directed the Chief Minister to take the vote of confidence it was clear that the government had been reduced to a minority and he was justified in asking the Chief Minister to do so. But even before the vote was to take place, the Speaker passed an order disqualifying those MLAs opposing the Chief Minister. The vote of confidence was (therefore) an eye-wash. But was the Governor right in recommending President’s rule and then changing his mind and having a second vote of confidence? It is his wisdom and I cannot question whether he is right or not. 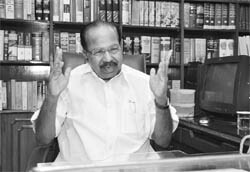 He had gone according to the parameters laid down in the Bommai case by asking the Chief Minister to take the vote of confidence. But what happened the first time in the Assembly could not be construed as a vote of confidence. Then what happens? The Bommai case does not prevent the Governor making such a recommendation that he did and it will not be seen as unconstitutional. Why did the Governor then ask him to take another vote of confidence? Normally, he need not have given another chance. There is no scope at all as within six months you cannot bring another vote of confidence. That is also the rule. But his was a magnanimous approach, though the BJP does not recognise that kind of magnanimous approach. I am not questioning the jurisdiction of the Governor but in his wisdom he gave another chance. And when he has given another chance what happened on the floor of the House? It was subject to the decision of the High Court. At the same time, you should know, the position again altered with the ruling party indulging in horse trading. A sting operation has exposed it. With this kind of horse trading, especially when the matter is pending before the High Court, does the government have the moral right to continue? Moving to another issue, there has been much debate over whether the current collegium system of appointing judges — regarded by many as akin to a division of spoils — needs change? All said and done, the Indian judiciary still enjoys the highest reputation worldwide. We have the largest judiciary and this debate whether the present system of collegium is right or wrong has been on since the mid-1990s. Many jurists, including former Supreme Court judges, say that this is not a correct system. Of course, the government is thinking whether we should reconsider this issue and put a system in place so that there will be greater transparency and objectivity and that people should not get an impression that the Judges are appointed in a non-transparent way. But at the same time, I do not say that everything is bad. It is not that easy to comment upon. We are just thinking that something should be done. Some changes are necessary. There was a proposal that just as the Chief Justice of a High Court is appointed a judge in the Supreme Court, a judge of the apex court too can be sent back to a High Court as the Chief Justice. Do you think such an inter-changeability is feasible? I do not subscribe to that. Once a judge comes to the Supreme Court, it’s the highest court. Sending the Supreme Court judge back to the High Court, I do not think, is a very palatable proposal. The Tribune has an on-going debate over whether appointing an outside Chief Justice to a state High Court is the best system? It is a time-tested practice that it is better to put a person from outside the state. Even then, nothing prevents the Supreme Court or the government to propose the Chief Justice from the same state. It is not a hard and fast rule. The practice has been to appoint an outside Chief Justice and it has really served the purpose. We are not contemplating any changes. Almost a third of the posts are vacant for judges. What is being done for that? Again, this is a question of the collegium system which is for sometime holding it back. This is why it is linked with the system that we are likely to evolve for appointment of judges. How is the government planning to tackle corruption in the judiciary? That is why we have now brought in the Judges Standard and Accountability Bill. No person with a tainted character can become a judge. The system will be such that once he becomes a judge, at no point of time will he be allowed to commit a mistake. If this kind of accountability is built, perhaps this perception will disappear. The Bill will be introduced in Parliament soon. There is huge pendency of cases and a lack of infrastructure. What are you doing to tackle these problems? We cannot just direct the judges to dispose of the cases. It is not going to serve the purpose. That is why now we are going into systems. The Thirteenth Finance Commission has provided certain modalities and the system to be adopted for the justice delivery system. We are now putting it in place. Almost 87 per cent of the pendency of cases is in the subordinate courts. We are addressing this question. We are also working on the litigation policy with which we will network everything and disposal will be done. Within a year or so, the system will be in place and ultimately it will be automatic and the pendency will come down. What are the details of this system? It is bringing in IT enabled systems to dispose of the cases. We are going for e-courts, paperless courts and other such methods. There has been much controversy over the Khap panchayats and the issue of honour killings. Are you looking into the issue? Khap panchayats as such are not illegal. But no one can kill anyone just because they have transgressed some family traditions and conventions. Such killing is cruel and barbaric and is a crime that needs to be punished. A Group of Ministers is examining this matter and ultimately we may come out with some solution. How do you justify castes in the Census? When we speak about inclusive growth for the country, we mean those people who have been left out from the mainstream of society and from economic and social benefits. They are from the backward classes. We have many programmes for the backward classes. The Planning Commission has some programmes as do the social welfare, rural development and many other departments. In fact, the Mandal Commission ordered reservation for certain castes. Whom do you give that reservation to if you don’t have data? But doesn’t such a census create more divisions? Caste is, no doubt, a cancer in society but at the same time when you are affected by cancer, you cannot operate the entire body; and you have to operate that portion after a proper diagnosis. How is that diagnosis done? It is by collecting the data as to who are the backward classes. If you are going to extrapolate by the 1936 census, as we do now, it is a total distortion. I think by ordering the caste census, we are getting into the basics of the societal picture backed with statistics. What is your explanation of the apparent delay in carrying out the death sentence of Afzal Guru who has been convicted for the attack on Parliament by terrorists? It has to be put into a wider context. How many people have been hanged in this country? I think only one in the past 20 years. That means the country is slow in hanging people even though capital punishment is given. Also after the mercy petition is filed, there is a certain procedure involved. We cannot hang him just because he is Afzal Guru. After all we are dealing with a person’s life. So the process has to be followed. It is also ensured that the new gene is expressed and leads to production in the recipient organism of the protein which it was otherwise unable to make. Thus, a bacterium or a yeast which cannot normally produce human insulin can be made to do so by introducing the gene for human insulin into the bacterium or the yeast in an environment in which the gene can function and make the bacterium or the yeast produce human insulin. It is now universally recognised that genetic engineering is one of the most important technologies developed in the last six decades and must rank at the same level as nuclear, space, computer and new information and communication technologies that have been developed during this period. The genetic engineering technology has already established its importance to mankind by producing extremely valuable drugs that were just not available earlier, now cheaply and in abundance. It also has the immense possibility of benefitting agriculture, for example, through production of plants that could grow in soil with high salinity. However, as of today, there is no way to direct a foreign gene to go to a particular site in the recipient host gene and to ensure that the only change that occurs in the recipient organism is the expression of the function regulated by the foreign gene. On the contrary, given the nature of available techniques in the area of genetic engineering, insertion of a foreign gene is most likely to cause multiple changes in overall gene expression in the recipient organism and, therefore, in the repertoire (qualitative and quantitative) of gene products such as proteins, RNAs and metabolites in the recipient organism. These changes may not matter if the organism is used under stringently confined conditions as in a suitably designed factory to produce products such as chemicals, drugs or vaccines which the recipient organism would not have produced if this foreign gene (or genes) had not been put in it through genetic engineering. However, only detailed molecular biological investigations (such as proteomics, transcriptomics and metabolonomics) will reveal whether these changes are beneficial or of no consequence, or harmful for men, animals and ecology, in case the organism is released in the environment. Over the years, since the development of gene technology nearly three decades ago, an increasing number of reliable scientific publications (reports and research papers) of high quality and hands-on experience of users of GM crops have documented their beneficial effects from the economic point of view as well as their deleterious effects on health (both of animals and humans), agriculture, economy and environment. lencourage research work in both private and public sector leading to the development of various kinds of GMOs that may be of potential benefit to society, provided it is ensured that the GMO cannot escape into the environment. lIt must ensure that no GMO is released in the environment unless the following criteria are satisfied: an appropriate socio-economic survey has been done and it has been found that there is a problem that can be addressed by genetic engineering; no alternative technology such as integrated pest management, use of biopesticides or organic agriculture would give the same or similar results as the use of GM technology would; the GMO has successfully gone through a stringent safety assessment protocol which has been approved by responsible scientists around the world and which would include proteomics, transcriptomics, and metabolonomics analyses; chronic long-term toxicity tests; detailed study of effect on parameters that control soil fertility, such as profile of soil microflora, trace nutrient content, and ability to retain moisture; effect on local ecology and gene flow; and agronomical analyses of the consequences of release of the GM crop (this list being only indicative and not exhaustive). The government should realise the right of people to know what they are eating or using. Therefore, any material containing more than 0.01 per cent of a GM product (this limit being based on the limit of sensitivity of tests available today for detecting the presence of GMOs) would have to carry a label to that effect. Similarly, food products such as vegetable oils derived from GM crops would also be required to be appropriately labelled. The government should recognise that some 62 per cent of Indians derive their total sustenance from agriculture or related activities and that some 70 per cent of India lives in its villages; food security, agricultural security, farmers security and security of rural sector are, therefore, synonymous; and to ensure the above security, it is an imperative that seed business is entirely in the hands of India alone. As the school observes Diamond Jubilee on October 21, Dr Peter is already planning to take the school to the next level without diluting from its core values. Inspired by James Tooley’s book, The Beautiful Tree that talks about educating slum children through private schools in Hyderabad, Dr Peter believes that private education for slum children, wherein elite schools like the Doon School act as incubators is an idea worth emulating. In an interview to The Tribune in Dehradun, he spoke about the need to promote education among the poorest of the poor without diverting from the Doon School’s avowed principles of producing men of sound mind and heart who continue to engage themselves in the service of the county. Q: You seem to be inspired by James Tooley’s book? Is that what you aim to do in the coming years — of providing education to the slum children? A: The ethos of the school have stood us in good stead. While building on our core competencies, we would also like to reiterate our commitment to serve the people. It is in this direction that as the School Headmaster, I am keen to involve the school in slum education. The school is already running such programmes at different places in Dehradun. But we would like to strengthen our involvement by providing quality teaching and much more involvement of our school, staff and students. We would like to go beyond the obvious, our boys have already made a mark in different fields. Now the school needs to be steered on a new path, in keeping with the wider aspirations of society that is now increasingly assertive and demanding. Education is an effective tool to battle poverty. Q: How much has the school changed over the years and do you plan to set up branches of schools abroad, the way Delhi Public School and other schools have done? A: We have introduced state of the art technology with interactive boards and wireless hubs, our class rooms wear an all together different look now. Technology has become second nature to our boys. Though we do not aim to produce geeks, the school continues to rely on homogenous mix of education, games and extracurricular activities. Our vision is different, we will continue to serve the people of India and as of now we do not plan to set up schools abroad. A high sense of fair play and social service are some of the values that are inculcated in our boys who then become an asset to a democratic society. Q: You spoke about technology. How far has the school been successful in putting in systems that prevent its misuse? A: As long as Internet is used for increasing one’s knowledge, it could be your best friend but we also know that it can prove troublesome. So, a careful scrutiny is maintained of all the sites used by the boys. Q: Why is the school unable to attract students from different parts of the country as it did in the initial years of its existence? A: Over the years, the number of students coming from different parts of the country may have reduced solely because people have more choices now. So, so many new schools have come up. But we continue to attract students from all over, cutting across geographical boundaries and economic strata. Seventy per cent of our boys are from small towns with their fathers in small businesses and other professions. Q: You are in the second year of your tenure. How has been your experience while tackling boys who speak a different language and have different set of values? A: It has been a good learning experience so far. As soon as I took office, I travelled all over the country to get a feel of the things. Parents all over the world expect their children to do well and become responsible citizens, while boys would be boys no matter where you come from rebellion has to be tempered with. He is behind the immortal lyrics — Dil cheez kya hai, aap meri jaan legeeia, In aankhon ki masti and Justuju Jiski thi. Also his verse Ish Shar Mein Har Shaqs Pareshan Sa Kyun Hai (why in this city everybody looks so haggard?). Every time you hear this song, you tend to think that the poet must have been a disturbed soul in a bustling metro. Yas Chopra promised three films a year if he shifted to Mumbai. However, Shahryar did not like fast pace of life in the metropolis because that made him fidgety. Shahryar has stayed away from film music for years. “The songs that are being composed nowadays…I can’t write such songs. It’s not that I am against those songs but I know I can’t write like that. That is why I am not writing for films any more. When a film is made where my songs would be suitable and needed, then I will definitely write”, he says. Shahryar was born in June 1936 at village Anwala in Bareilly district of Uttar Pradesh. He received his early education in Bulandshahr. Later, he studied at Aligarh Muslim University. There have been twists and turns in his career. His father wanted him to become a policeman as most of his family members were in police force. Also, he was good in hockey and at one stage he wanted to become an athlete. Finally, he ran away from home and found a patron in poet Khalil-Ur-Rehman Azmi of the Aligarh Muslim University (AMU). While staying with him, Shahryar realised that there also is a poet lurking in him. He started his career as a literary assistant at Anjuman Tarraqqi-e-Urdu. Thereafter he joined the AMU as a lecturer in Urdu. He was made professor in 1986. In 1996, he retired as Chairman, Department of Urdu, AMU, where he now lives and devotes his time entirely to poetry. He also co-edits the literary magazine Sher-o-Hikmar (Poetry and Philosophy). Shshryar spent most of his life teaching Urdu fiction because he thinks poetry can’t be taught at the languid environs of the AMU. The poetry, he thinks, should transcend place and generations. That’s why, Ghalib is far more relevant today. “Mumbaikars think the song tells their story; Delhi-ites feel it belongs to them”, he says. One of the novels he taught for years was Umrao Jaan. When he had joined the AMU’s Urdu department, Muzaffar Ali was a science student. At that time he was known for his paintings. During a meeting with him, Shahryar presented him a collection of his Urdu poems. Years later when he ventured into filmmaking with Gaman, he remembered Shahryar, “We used to discuss the need for an authentic film on Oudh culture. Muzaffar is from this region and I was well aware of the nuances of Umrao Jaan. So things fell in line”, he was quoted as saying. His first poetry collection Ibne-e-Azam was published in 1965, the second collection came out in 1969. And the third was released in 1978. His most celebrated work Khwab Ke dar band hain (The doors of the dream are shut) came in 1987 for which he won the Sahitya Akademi Award. He also published five collections of his poetry in the Devnagari script. 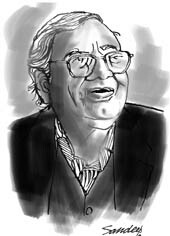 Shahryar shaped himself as an intellectual poet whose poetry strongly expresses an ideological non-commitment. His roots lie in the poet’s desire for self-realisation and his attempt to understand modern problems. Shahryar is not concerned in his poetry with messages or conclusions. Rather, he expresses the spiritual suffering and psychological anguish of what he regards as the “wounded modern man”.